Lifetime Storage Sheds - Who Has The Best Lifetime Storage Sheds? Lifetime storage sheds are a practical alternative to traditional timber sheds, and from a manufacturer who is becoming increasingly popular. Being made primarily of high-density polyethylene, they’re very durable and reliable, and they can be found in styles and sizes to suit just about anybody. 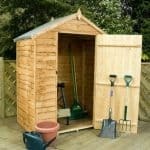 If you’re looking for a plastic storage shed for your garden, then take a look at this WhatShed guide to the very best Lifetime storage sheds that can be bought online in the UK today. 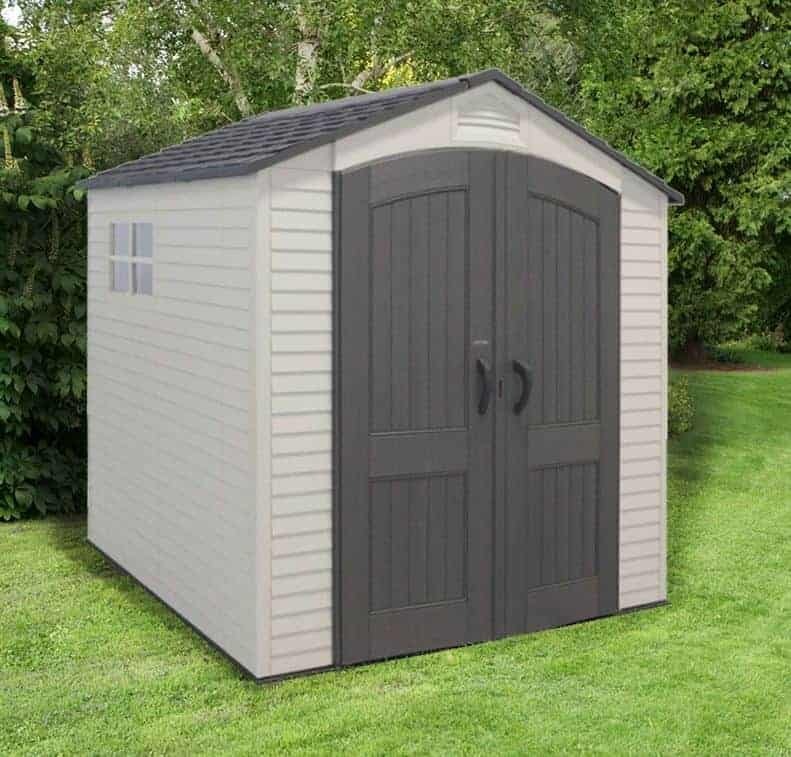 When researching Lifetime storage sheds, we were pleased to find five high quality models that stood out for us and therefore deserved a place in our league table. When ranking the individual sheds we considered the storage capacity, price, value for money, and visual appeal. Lifetime make plastic storage boxes and large workshops, many of which can be extended by adding extra modules, as well as storage sheds, so how did we define what Lifetime storage sheds were? They had to be, in our opinion, primarily for garden storage purposes, rather than being workshop oriented as some larger models are. 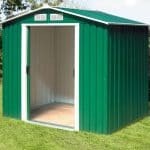 It’s for this reason that we only considered sheds with a base area of less then eight square feet, and we were happy to find five high quality and unique models that met this criteria. With such a high standard among all the sheds in our table, selecting the winner was difficult. 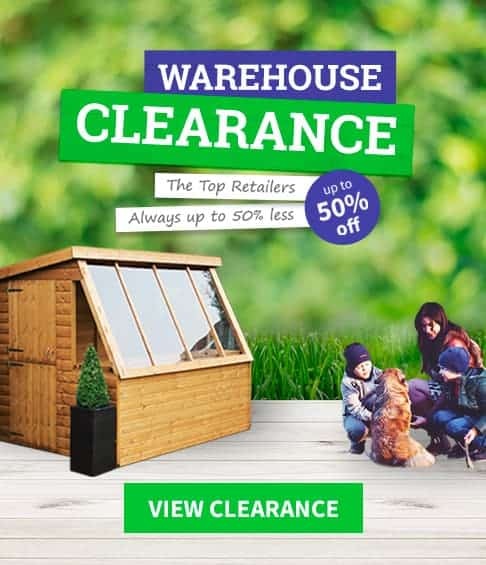 It’s well done then to the seven foot by seven foot model which thanks to its exceptional value for money and its attractive window including design, takes the top place in our guide to the best Lifetime storage sheds that can be bought online in the UK today. From sheds to greenhouses, WhatShed bring you independent reviews that can help you find your ideal garden building. Lifetime are one of the most popular manufacturers of plastic sheds, and this seven foot by seven foot model is a perfect example why. 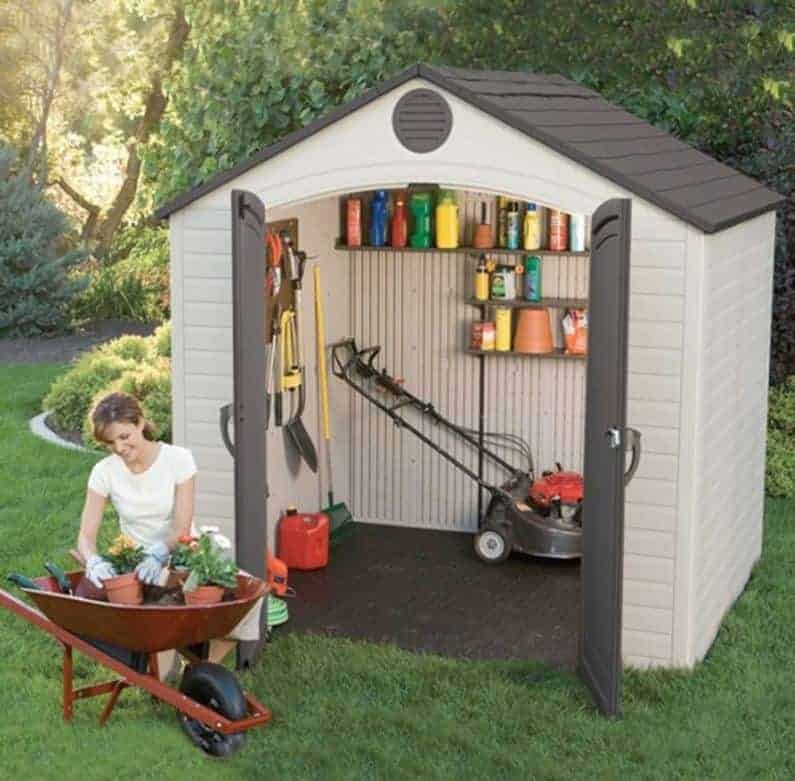 People who haven’t seen them or owned one before may feel that Lifetime storage sheds will look cheap or too plastic for their garden setting, but as this model shows they can look very stylish. The contrast between white walls and the dark grey door and roof is very pleasing on the eye, and we feel it looks very contemporary. If you have a modern house, and a modern garden, this will fit right in and the plastic cladding will complement features such as PVC conservatories and roof lines. As with all of the Lifetime storage sheds to feature in this league table it comes with the reassurance of a 10 year manufacturer’s warranty. This is something that we always welcome, as many of the plastic garden sheds that we see from other manufacturers come with only the statutory one year guarantee. What impressed us even more than the good looks and generous warranty, however, was the value for money that this offers. With a price tag of less than eight hundred pounds, this costs less per square foot than any other Lifetime shed we’ve reviewed. It’s this that takes this mid sized storage solution to the very top of our league table. Unlike the seven foot by seven foot model that tops our table, these Lifetime storage sheds have no windows. 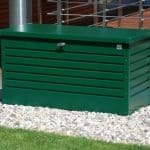 Whilst this means they are less than ideal for spending prolonged periods of time inside, we feel it can be a positive addition to their primary function of being a garden storage facility. Having no windows there is no way that passers by can see inside and determining whether anything of value is being stored within, and in our opinion that’s a big boost to security as it means that opportune thieves are less likely to attempt to break in. We were also pleased to find that the handles on the double hinged doors are easy to attach a padlock to, so that increasing security still further can be both simple and cheap. Even though it has no windows we were pleased to see that vents were included in the apex roof, and there’s also a round vent at the front which we found a decorative and eye catching feature. 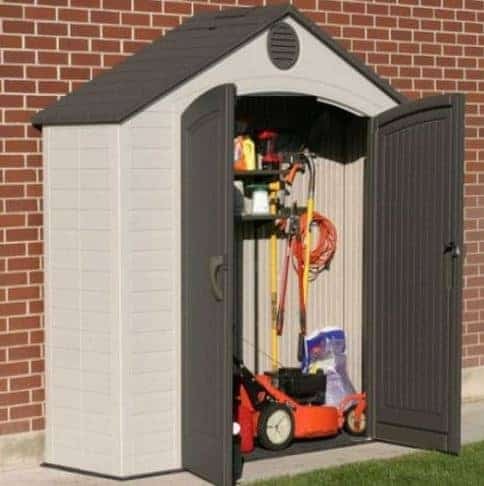 The double doors also feature a curved top, which again we found pleasing on the eye and they help to elevate Lifetime storage sheds above most other plastic sheds that we review. As the doors are wide opening as well, with an accommodating width of 1.42m, they allow natural light to reach every corner of the eight foot by five foot interior when they are opened. Once again, we were also impressed by the value for money provided here, which is why it takes the runner up spot. 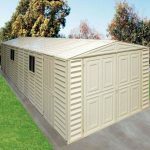 With a base area of 2.06 x 1.49m these are not the smallest Lifetime storage sheds we’ve reviewed, and yet they are the cheapest. The asking price of just under six hundred and fifty pounds makes these high quality and visually striking sheds available to more people than ever before, and it’s this excellent value for money that earns it third place in our league table. Once again there are no windows, which is a positive feature if you think of security as one of your main concerns when buying a garden storage facility. There are, however, translucent panels in the roof that act as skylights, and so on a sunny day the interior is illuminated, making the storage and retrieval of items easy. If you’ve only purchased wooden sheds before, then Lifetime storage sheds such as this bring some significant advantages. Foremost among these is their durability as they can’t rot or rust, and aren’t prone to rodent or insect attack as some other sheds can be. The plastic used should feel very strong, and it’s UV resistant so you won’t have to worry about the attractive light and dark colour scheme fading over the years. 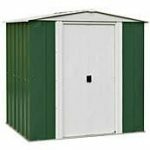 These are the largest of the five Lifetime storage sheds to gain a place in our league table, with a base area of 2.43 x 2.28, although the manufacturer does make much larger sheds that are primarily designed as workshops. It also comes with by far the highest asking price, which is why it finds itself in the penultimate position. We found a lot to like about it, however, so if you don’t mind the price tag of over a thousand pounds, then this could be the ideal storage shed for you. 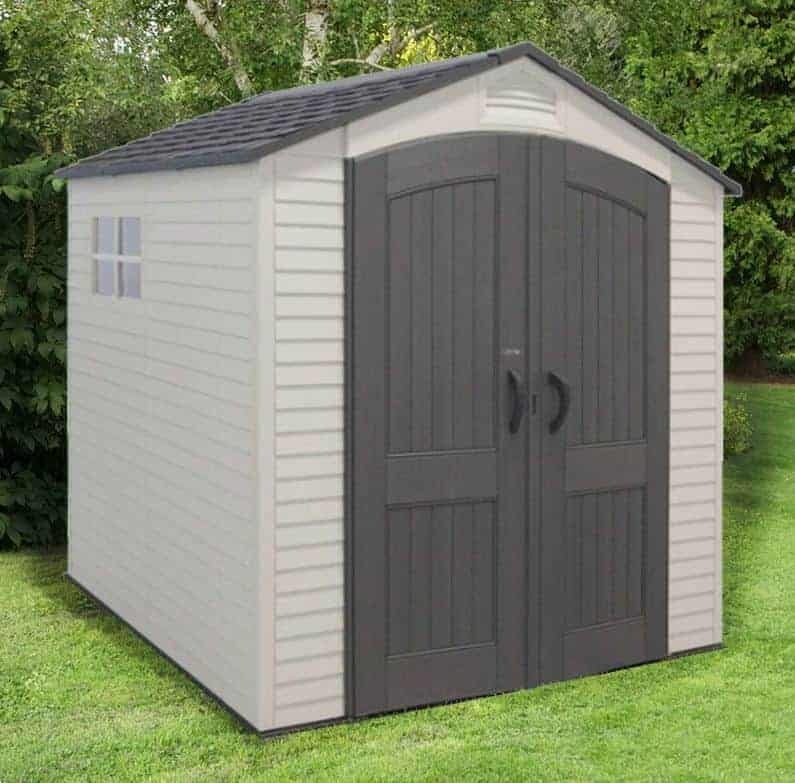 This is one of the most aesthetically pleasing of all the Lifetime storage sheds we’ve reviewed, although it sticks to the white and dark grey colour scheme that’s become associated with this manufacturer. The plastic walls are given a timber effect by being styled in an overlap design, and we particularly liked the shingle style roof that we were pleased to find is given extra strength and durability by a galvanised steel frame. There are two square windows which have an attractive cross hatching, and extra light comes by way of skylights in the roof. With the generous interior capacity as well, we feel that this would even make a suitable environment to work in, or to carry out a hobby, during daylight hours. 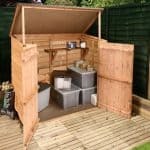 The final place in our list of the best Lifetime storage sheds that can be purchased online in the UK today goes to a model that has a look and design all of its own. That’s because the shed has a reverse apex and is approximately four times as wide as it is deep, giving it the appearance of a wide sentry box. We found it quite attractive, and it’s ideal for people who have relatively wide gardens but don’t have much depth to their lawn in which to position their shed. 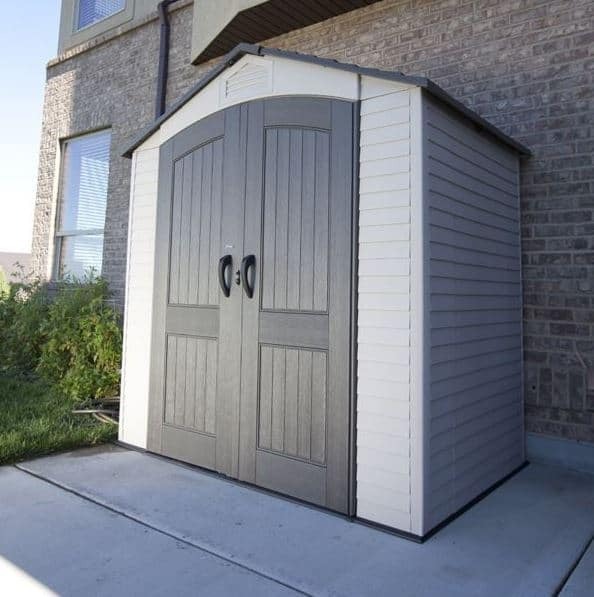 One unique feature that we really liked about these eight foot by two foot Lifetime storage sheds is that they come with integrated shelving. There are two shelves attached to the back wall, and also two corner shelves which are ideal for smaller items such as pots of paint. It’s worth noting as well that the high density polyethylene used in all the sheds in this league table is not only tough and durable it’s also fire resistant, which makes it a suitable location to store flammable materials. If you want a compact shed that should last for far longer than its 10 year warranty period suggests then this could be a smart choice, but its relatively high asking price keeps it in our league table’s final position.